There is indisputable value in being vulnerable, in being open, in deciding—for better or for worse—to share your truth in a world filled with people that so desperately need to hear they’re not alone. Whether it’s spreading honesty about the emotions that both men and women face in and out of relationships, the struggles of a breakup, or the exhaustively long process of healing, when we share our hearts and the things we’re going through, we learn that we aren’t the only ones. We realize that life, though extremely painful at times, can be navigable—especially when we choose rawness over hiding what we truly feel. About a year ago, I stumbled upon, and featured an amazing band by the name VOILÀ. This band is a duo of two young men from Southern California—Luke Eisner and Gus Ross—who decided to embody vulnerability with their music. Their goal, through pop-rock sound, was to make tunes that would not only be relatable, but hit home when it came to matters of the heart. With songs like “Hundred Second Chance,” which specifically speaks to the back-and-forth of relationships, and “Lately,” that beautifully (and painfully) describes the way some connections fall apart in time, it’s clear that vulnerability is at the forefront of everything they create. 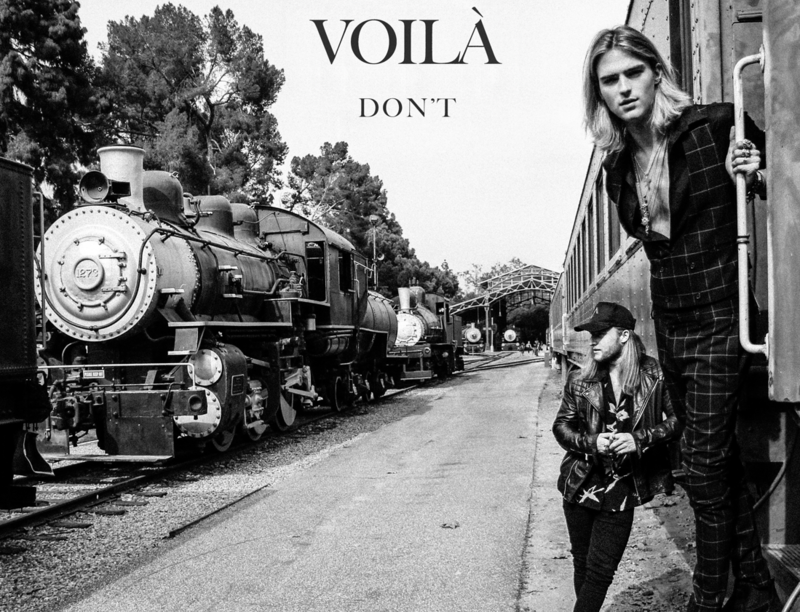 Their latest single, “Don’t,” is going live today, November 9, 2018 (it’s already #19 on Spotify’s New Music Friday), and it’s taking rawness to a whole new level. Beyond lyrics that ache in your chest and a melody that you can’t help but hum to, the boys are looking to reach people even deeper, as they discuss toxic relationships and the addictions to the people and things that might not be good for you. Right from the start—with gentle acoustics and raw vocals—the song dives right into the heart of painful post-breakup emotions. As anyone who’s been in an on-and-off-again relationship can relate to, the song expresses the feeling of not knowing how to live without the person you’ve known, even if you can acknowledge the toxicity of the situation. I sat down with the boys to ask them a bit about the song and why they felt it was such a strong message to share. And he speaks truth here. So often it’s the people closest to us that we have the most conflict with. It’s the people we love the deepest that we can’t quite let go of. Even if we’re aware of how bad that person is for us, it’s still so incredibly difficult to detangle from the web we’ve woven with and around them. The song’s lyrics reference smoking and drinking—vices that are physically harming the body—as a metaphor for unhealthy love. The duo does an excellent job of painting a picture about what unhealthy looks like and how, even though toxic relationships may be fully recognized, it’s not always easy to walk away. “The best way to explain the song: When I was really young there was this willow tree in my front yard, a weeping willow. I would always try to climb this tree when I was younger. My parents would always say ‘you’re going to hurt yourself,’ [and my] friends would say, ‘you’re wasting your time.’ [And they were right], I [still] have a scar from falling. [But] what my friends and parents didn’t’ understand, [is that the three had] the best view of the subdivision and the sunset. It was the kind of view that made you forget how much you hated the climb. In hearing that behind-the-scenes, the message of the song hits even deeper. As someone whose found herself in my own share of difficult relationships, I can resonate with the lyrics and feel the exact pain they’re trying to express—wanting to let go so bad, but losing myself in the connection. Focusing on the ‘good parts’ and forgetting the bad. The duo’s main goal behind sharing this heartfelt ballad is to relate to people who may be in similar situations. Not only do they want to show people how difficult it may be to detangle from toxic relationships, but they also want to encourage individuals to recognize when their love falls more towards a negative addiction than a positive connection. Beyond their music, the boys support the One Love foundation, and hope that their song can bring awareness to people about what a truly healthy relationship is. Above all, though, they share their hearts through their sound, and in a world so desperate for authenticity, this is a breath of fresh air.